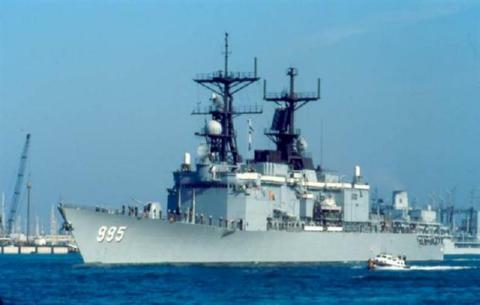 The USS SCOTT (DDG-995), a Kidd class destroyer, was commissioned on 24 OCT 1981. Orginally USS SCOTT was built for the Iranian Navy, but was never delivered due to the Iranian Revolution in 1979. SCOTT joined the Atlantic Fleet after commissioning, first homeported at Norfolk, Virginia, and later in Mayport, Florida. SCOTT deployed to the "MED", North Atlantic, "IO" and "GIMO". USS SCOTT was in the Med in 1995 during the Gulf of Sidra operations that President Reagan used to pressure Libya and acted as the shadow of the SS ACHILLE LAURO, a cruise ship that was hijacked by the Palestine Liberation Front. USS SCOTT served her country for 17 years, 1 month and 16 days, until decommissioned on 10 DEC 1998. In 2004 she was sold to the Republic of China (Formosa), and commissioned as ROCS Kee Lung.